As the various cities of the Saraswati-Indus Basin declined, some two thousand kilometers away, the Akkadian Empire also vanished. Was that a co-incidence? This extract above, from clay tablet, known as the Curse of Akkad, dated 2200 BC, gained documentary credibility after some recent research. This study showed that it was not Gutians who destroyed Akkad, but it was the multi-century drought. This study, indicated a prolonged drought in the Akkadian region. To confirm Akkad’s drought, soil samples were analysed. 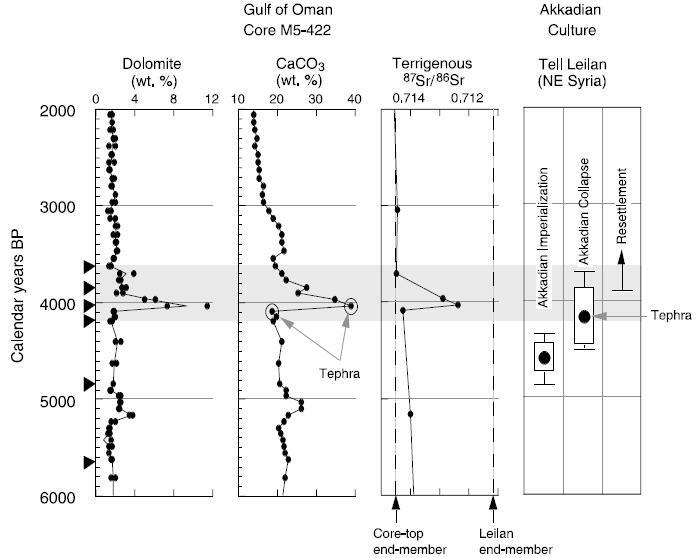 This study confirmed (Weiss 1993) that a prolonged drought significantly, affected the Akkadian empire. Pretty much like what the Indian pollen deposits research did, (Gurdip Singh – 1967-71), in the lakes of Rajasthan. After about 3500 yr B.P., the Lunkaransar profile indicated a desiccated lake bed; because no pollen was preserved, the pollen-climate calibration function was of no use for estimating the amount of the precipitation decline. This drought and the tectonic movements were seemingly linked from India to Turkey – right upto Africa. North America was not spared from this climatic phenomenon. Sympathetic evidence has been found in Europe of this huge climatic disruption. A severe drought in parts of low-latitude northeastern Africa and southwestern Asia 4200 yr ago caused major disruption to ancient civilizations. Stable isotope, trace element, and organic fluorescence data from a calcite flowstone collected from the well-watered Alpi Apuane karst of central-western Italy indicate that the climatic event responsible for this drought was also recorded in mid-latitude Europe. abrupt drought events occurred conspicuously at ca. 12,000–11,500, 8500, 7500, 4500, 4000–3700, and 2000 uncalibrated radiocarbon years B.P. Further investigations are required to gain a more precise chronology of these events, which appear to have been crucial for some of the most salient developments in Africa’s prehistory. Over a long period, from 2200 BC-1500 BC. It affected large parts of Africa. This extended period of drought may have covered most of South-Western Asia. Some drastic tectonic activity also coincided with this drought. In Turkey, it produced volcanic activity which disrupted lives. In India it affected Sindhu /Indus, and the Yamuna rivers. And gave birth to Ganga. Most famously, this tectonic activity dried up the Saraswati river. The drying up of the Saraswati river and the changes in the Sindhu /Indus river course, created many ghost towns, especially in North West India, upto the Sindh region. Strabo’s 17-volume work Geographica, has something interesting to say about deserted and abandoned villages and townships. It mentions thousands of villages and cities, in India – abandoned, during Alexander’s raid into Northern India. Some 1500-2000 years after the demise of Saraswati and the change in the course of the Indus. Aristobulus … says that when he was despatched upon some business into the country, he saw a tract of land deserted, which contained more than a thousand cities with their dependent villages ; the Indus, having left its proper channel, was diverted into another, on the left hand, much deeper, and precipitated itself into it like a cataract, so that it no longer watered the country by the (usual) inundation on the right hand, from which it had receded, and this was elevated above the level, not only of the new channel of the river, but above that of the (new) inundation. What do the Indian texts say? 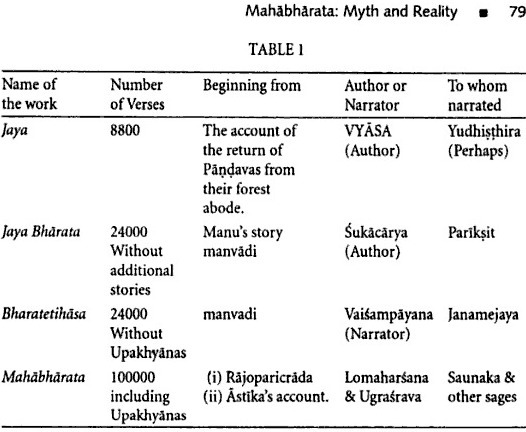 The Evolution of Mahabharata (Table courtesy – Delhi: Ancient History By Upinder Singh). For centuries now, Indians ‘knew’ of the ‘lost’ Saraswati river. What is the source of this Indian oral narrative? Saraswati is mentioned more than 60 times in the Rigveda. But, the Ganga gets only one mention – and that too, possibly a latter-day insertion. Saraswati, as the river is the “purest among the rivers, flowing from the mountains to the sea.” The sixth book of Rig Veda (6.61.2), describes the powerful Saraswati, in her course through the mountains, “slayeth the Paravatas.” In the Gritsamada verse (II.41.16), Saraswati is ambitame, naditame, devitame Saraswati. (“Saraswati, best of mothers, best river, best goddess.”). As the river dried, Saraswati changed from being a river goddess to the goddess of learning, wisdom and music. Was it because most of the Indic texts and knowledge was composed along the banks of the Saraswati? Was the extinct river honoured by being elevated to ‘devi’ status! As the Saraswati progressively dried up, migration to the Indo-Gangetic plains gathered steam. Indian textual narratives also changed. There are added allusions in Mahabharata to the underground Saraswati and there are numerous mentions of Ganga in the Mahabharata. The earliest available report of the drying up of this river is in the epic literature of the Mahabharata where it says that the river went underground at Binasana, near the present town of Sirsa. The Mahabharata also mentions the reappearance of the Saraswati at three places down stream, then known as Chamasodbheda, Sirobheda and Nagobheda. (from The Lost Courses of the Saraswati River in the Great Indian Desert: New Evidence from Landsat Imagery, by Bimal Ghose, Amal Kar and Zahid Husain © 1979 The Royal Geographical Society (with the Institute of British Geographers). This people “movement is reflected in the shift from Vedic literature that is centred on the Sarasvati to the Puranic literature that is centred on the Ganga.” How is the Saraswati river related to the ‘Indus Valley Civilization’? How is the dried up River Saraswati important to Indian history? How and why did the Saraswati river dry up? originated in Bandapunch masiff (Sarawati-Rupin glacier confluence at Naitwar in western Garhwal). Descending through Adibadri, Bhavanipur and Balchapur in the foothills to the plains, the river took roughly a southwesterly course, passing through the plains of Punjab, Haryana, Rajasthan, Gujarat and finally it is believed to have debouched into the ancient Arabian Sea at the Great Rann of Kutch. In this long journey, Saraswati was believed to have had three tributaries, Shatadru (Sutlej) arising from Mount Kailas, Drishadvati from Siwalik Hills and the old Yamuna. Chronology of the Saraswati river system | Source & courtesy – Saraswati – the ancient river lost in the desert A. V. Sankaran | Click to open larger image. Based on satellite imagery and research, there is an apparent correlation between the dried up Saraswati river bed and most of the ‘Indus-Valley civilization’ archaeological sites. the source of the perennial supply of subsurface water in western part of the Great Indian Desert where annual rainfall is so meagre and erratic (less than 150 mm) that it cannot contribute substantially to the perennial wells of the area. runs through an open country with little or no cultivation, and may be increased to any breadth; camels may march by it fifty abreast on either side of column of troops. While the Saraswati dried up, it left behind tell-tale markers. ISRO has dug up 23 tube wells along the course of the river mapped by it across 70 kilometers west of Jaisalmer in Rajasthan. The results have been startling. All the wells have provided good quality drinking water with very little Total Dissolved Salts (TDS). The water itself was found at a depth ranging from 35 to 60 meters which is unusual for the area which is covered with sand dunes. “We also dug a well 50 meters away from the channel and yielded water with very high TDS content proving quality water exists only around the old river bed of the extinct river,” he added. In 1968, deep bores were sunk along the dried river bed. The alternate plentiful supply and scarcity of water in the river is confirmed by the boring in the river bed by Raikes, 1968. This tectonic-climatic disturbance affected a large swath of the Indian sub-continent. What part of India did this combination of drought and tectonic activity affect? Out of nearly 2,600 archaeological sites of varying sizes, over 1500 archaeological settlements were found on the Sarasvati river basin; there are also major settlements (some of) which are larger than the settlements of Harappa and Mohenjodaro (100 ha. each), Lakhmirwala (Bhatinda) (225 ha. ), Rakhigari (Hissar) (224 ha. ), Gurnikalan One (Bhatinda) (144 ha. ), Hasanpur (Bhatinda) (100 ha), Ganweriwala (Bahawalpur) (81.5 ha), Kotada (Jamnagar) (72 ha. ), Nagoor (Sukkur) (50 ha. ), Nindowari (Jhawalan) (50 ha), Tharo Waro Daro (Sukkur) (50 ha. ), Mangli Nichi (Ludhiana) (40 ha.) (underlined text supplied). Saraswati archaeological sites, given a misleading name of ‘Indus Valley Civilization’ are the oldest date-able evidence of Indian culture – going back to earlier than 3000 BC. With retro-fitted history, the ‘discovery’ of the ‘Indus Valley Civilization’ was inconvenient, for Western history, based on Biblical logic of the Ussher-Lightfoot chronology. There are two fallacies with the nomenclature of ‘Indus Valley Civilization’. There is no proof altogether, that the Indus Valley Civilization was separate and different from Indian civilization. By the simple act of naming it as Indus Valley Civilization, Marshall-Woolley-Wheeler-Piggott have made out illogical assumptions – without a shred of evidence. One – as though Indus Valley was apart from the Indian civilization. Para-dropped by a passing alien ship, maybe? Or two, the subsequent evolution and developments in India were discrete and unrelated to the Saraswati sites. There is no evidence to support either of the ‘ideas’. The other major reason is that since the sites are clustered around the Saraswati river bed, the term Indus Valley ‘civilization’ is misleading – and no longer valid. This cluster of sites should correctly be called Saraswati Basin sites. How did the entire Saraswati theory come about? How did this start off? After Indian independence (1947), faced with an acute shortage of research sites, Indian academic establishment broke new ground. India was left with just one Indus site, in Gujarat and a couple of other sites towards the north, so there was an urgency to discover more Indus sites in India. This has been among the big achievements of Indian archaeology post-independence – that hundreds of Indus sites today are known, not only in Gujarat but also in Rajasthan, in Punjab, in Haryana, and even in Utter (sic) Pradesh. Mohenjo daro and Harappa excavations now fall in modern Pakistan. In the face of limited access to sites in Pakistan, Indian archaeologists focused on Indian sites. Many sites were discovered in the post-colonial Indian area – apart from Harappa and Mohenjo daro. There are whispers that historians and archaeologists from India (especially, the Saraswati school) have been denied access. Some Indian archaeologists have charged HARP with interjection of newer kinds ‘politics’ into research of the Saraswati Basin and Indus Valley. Since Harappa and Mohenjodaro were the first to be excavated in the 1920s, Sir John Marshall, who headed the team of explorers, called it the Indus civilisation because it flourished in the valley of that river. Marshall’s announcement wowed the world and pushed India’s known history back by about 2,000 years. At the time of Independence there was no real need to change the epithet as barely a dozen Indus sites had been explored. With the prime sites, Mohenjodaro and Harappa, going to Pakistan, however, a feverish hunt began in India to locate and excavate Indus sites — a race that its neighbour soon joined. In doing so, they began uncovering a civilisation … vast in its extent … (from The Indus Riddle, By Raj Chengappa, ellipsis supplied). Considering the importance of the Saraswati sites, to the world (and Indian) history, Indian academics used a multi-disciplinary approach. Evidence from extensive radio-carbon dating, satellite imagery, hydrological studies, statistical analysis was integrated for creating a context for Saraswati sites. Further, it is but a natural corollary, that “as the river dried up completely in the second millenium BC, albeit in several stages and with several reversals …” settlements and towns at Saraswati were abandoned. 4000 year-old Indian oral history has now been vindicated by modern research. These tectonic shifts that dried up Saraswati, also had different effects on the cities of the Indus-Saraswati complex. Some 90 miles down-stream from Mohenjo daro, is the Manchar Lake, at Sehwan, spread over large area. It was recently estimated at some 24 sq. km, and in 1890, as some “twenty miles by ten” – that is some 200 sq. miles, the largest fresh-water lake in Asia. These tectonic shifts , probably, created the Mancher lake at Sehwan. This lake plausibly, flooded Mohenjo daro some 7 times. The many layers of silt at Mohenjo daro can be accounted for the flooding of the Lake Mancher, at Sehwan. Even today peopled by the Mohana fishermen-tribe, who some believe to be remnants of the original Mohenjo daro residents – an assumption based on thin evidence. There are modern recorded parallels of such events. In 1819 an earth tremor in Kutch created a huge natural dam 75 miles long and upto 16 miles wide that disrupted the flow of the Eastern Nara branch of the Indus. After 7 years, however, the rivers floodwaters created a breach and the Nara resumed its flow to the sea. Harappa seems to have suffered more due to reduction in the inflow in the Ghaggar-Hakra rivers due to change in the flows of either the Yamuna (into the Ganga) or the Sutlej (into the Indus). To this cataclysmic event, add the long travelling global drought. Artifices and contradictions in the story proposed by Marshall-Woolley-Wheeler-Piggott structure started showing up, as more and more data piled up. Outcome – the Saraswati Theory, a more unified approach to history. Channels have been mapped, soil sediments studied, groundwaters analysed and earthquake history investigated. And not all of this is recent work. European colonial surveyors, agents and adventurers of all kinds who travelled at ground level, as it were, observed, measured and recorded what they saw. They also noticed that this arid, thinly populated wasteland was densely peppered with the remains of ancient, permanent settlements — many of them city-size, which could never have existed without abundant year-round water. In some cases, these pioneers recorded what they heard too, such as folk traditions which told of a time when a great river flowed through the region. The earliest and the most well-known Indus Valley and the Saraswati Basin sites are now in Pakistan. Pakistani sites are controlled by an ‘independent’ American-Pakistani project – named HARP (Harappa Archaeological Research Project). Accepting the Sarswati thesis is, but anathema, in Islamic Pakistan, which is an important part of the HARP project. Not to forget, that it makes Western historical research of the last 150 years redundant – which complicates research. More than 10,000 libraries will have to junk more than a million history books. What further held up research in the Saraswati belt was the fact that two sides squared up are the US-Pakistan HARP collaboration, on one side. The Saraswati team on the other. Neither is asking or willing to give a quarter in this struggle to write history – the history of mankind. Seemingly, the Saraswati vs Indus has acquired overtones of India vs Pakistan. And may history be damned! Most of the Saraswati Basin work was done at Indian institutions, under differing degrees of political patronage and dispensations. With multinational collaboration from India, Pakistan, Europe and USA, with many false starts and tangential movements, the Saraswati Theory has acquired a certain acceptance. This acceptance, in spite of spirited opposition from HARP, has possibly made the WASP-Pakistan, narrow-cast establishment under the Farmer-Sproat-Witzel combine defensive. Not to be outdone, having failed at the exclusion and shutting out game, the same players are trying to work from ‘within’ the Indian system. Before rushing pell-mell into such ‘joint-ventures’, it may be worthwhile to remember the dubious role played by Western archaeologists in various parts of the world. Some ‘historians’ have come up with the thinnest of ‘evidence’ against the Saraswati theory. Like rivers from neighbouring geographies with similar sounding names. Much like York became New York, so also there is Megiddo (of the battle fame), Makedonia (home of Alexander), Mary Magdeline came from Magadan, Megasthenes came from Magasthan (Magan, land of the Magi) – all candidates for Magadha cognates. Kannauj near Patna finds an echo in Kahnuj of ancient Carmania (now Kerman, the largest province in modern Iran). Byzantium is a Vaijayanti cognate. Byzantine traditions were influenced by India. The name Byzantium itself was possibly derived from Vaijayanti – also the ancient capital of Satavahana Empire, now in Goa. The Greek and Egyptian cities of Thebes are possibly cognates of To Po (Upper Tibet) – now known as Tibet. As does Judea – derived from Ayodhya->Yehudiya->Judea. Saraswati, a celebrated river, also had cognates. Harahvati /Harkhawati in South-West Afghanistan is another ‘suspect’ for the Saraswati mentioned in the Vedas, Sarayu with Harirud. There are other such thin claims that Gomti and Gomal in Baluchistan are the same. Lower Paleolithic is about 250,000 years ago and early historic period in India is 3000 years ago. The real marker in this case may be the depth of the civilization. Why is it that there is no evidence of Sanskrit in all these ‘Central Asian’ locations from where these ‘Aryans’ came from? Why did Vedic learning survive only in India? How is it that Vedic Gods survived only in India – and not in the ‘Aryan homelands’. How come there are lakhs of Sanskrit texts in India, but none where Sanskrit supposedly originated from? In Central Asia! excavation of Lothal, an Indus port town located off the Gujarat coast. It shattered notions that the Indus was a landlocked civilisation, conservative and isolated, and as a result sank without a trace. Rao uncovered a dock 700 ft long — even bigger than the one currently at Visakhapatnam. It took an estimated million bricks to build it. Next to the dockyard were massive granaries and specialised factories for bead-making. Hundreds of seals were found, some showing Persian Gulf origin, indicating that Lothal was a major port of exit and entry. “that the Indus River changed course, which would have hampered the local agricultural economy and the city’s importance as a center of trade. But no evidence exists that flooding destroyed the city, and the city wasn’t totally abandoned … and … a changing river course doesn’t explain the collapse of the entire Indus civilization. So, what does explain this, Witzelbhai? Blue-eyed, blonde, White Aryan invaders, thundering down the Khyber, I presume! As the Saraswati River became erratic … and started drying. (Click to get larger image). We do not see archaeological finds of the Saraswati type in the rest of India, because the rest of India continued with life, at existing settlements. Most Indian cities have been settled for centuries – and have not seen vast archaeological excavations. And in all these centuries, Indic peoples moved up and down from South to North to South to East and West – from living settlements to living settlements. Given the vastness of the Indus empire, V.H. Sonawane, director, Department of Archaeology and Ancient History in the MS University of Baroda, points out: “The first casualty is the earlier notion of a Harappan homogeneity. It is clear that there was tremendous regional diversity just as we have in modern India.”(from The Indus Riddle, By Raj Chengappa, ellipsis supplied). In the ’70s, when Braj Basi Lal, a former ASI director-general, began excavating Kalibangan, a site in the desert sands of Rajasthan, he was amazed to find evidence of a field of crossed furrows dated to around 2900 BC, preserved by a strange quirk of nature. Looking around he found that farmers in the region used a similar ploughing technique even after 5,000 years. The ancient houses had tandoors (earthen ovens) similar to ones found in kitchens in the villages in the area. As Lal says, “It was as if the present was the past and that despite the passage of time not much had changed.” (from The Indus Riddle, By Raj Chengappa, ellipsis supplied). Independent research in Pakistan, by the noted specialist, RM Mughal echoes the same. The ability of the Indic people to live with diversity in skin colour, language, food, lifestyle, trade and thinking is an age old phenomenon. Mughal’s studies in Pakistan have helped chalk out an approximate chronology of the changes. The beginnings of village farming communities and pastoral camps were reported as early as 7000 to 5000 BC. But developed farming communities, which grew wheat and barley, emerged around 4300 BC. In a site called Mehrgarh near the Bolan river in Baluchistan province, there are signs of agricultural surplus with the establishment of community storage silos. The conclusion: Sorry to use the cliche, but we had unity in diversity even then. (from The Indus Riddle, By Raj Chengappa, ellipsis supplied). To make sense of this cataclysmic event, one also needs to read the account of how the Ganga was brought down from the heavens – which we will in the next post. The Ramayana takes much time in describing how the Ganga was ‘persuaded’ down from the heavens. The holy Indian trinity of Brahma, Vishnu and Mahesh contributed their efforts and might to his ‘cause’. 1972. India, basking in the warm after-glow of the military victory in the 1971 War with Pakistan. The Oil crisis was yet to hit India. Indians were taking hesitant first steps towards a remittance economy. Rich, expatriate neighbours, relatives and friends were spreading the words of ‘phoren’ opportunities to Indians. The 1973 Oil shock and the Bombay High discovery were a few years in the future. As were India’s remote sensing satellites (1979). That year, was the first time I heard about the supposedly subterranean Saraswati river. From my grand-father, at Haridwar संगम sangam (meaning union). The Indian oral narrative, goes that Saraswati meets up with ‘sister’ rivers, Ganga and ‘Jumna’ at Haridwar. I did the dip at संगम sangam, as any संगम sangam of rivers is a considered shubh (a fertility symbol?) – and a dip is called for. Later, my mother too, corroborated the Saraswati ‘story’. The Kaveri sangam at Srirangapatinam (Picture courtesy – Travelpod; by Indian nature). In (was it?) 1973, a small rivulet, which joins the Musi at Hyderabad, (a tributary of Krishna river) was at full flow, due to huge cloud-burst. That year, on dubki poonam, (the first full moon after Diwali, reserved for a bath at any river), the entire extended-family was bundled into a few vehicles, to go for a dip in this insignificant ‘river’. Never after 1973, did I see that rivulet flow so strongly again. In 1977, at Seringapatinam, we did a dip at the Kaveri sangam – a संगम sangam of two arms (Kaveri and Lokapavani) of the same river. At Rishikesh, the संगम sangam of Ganges and Chandrabhaga, I did daily dips for about 45 days in 1972. Also at Rishikesh, is the Triveni ghats, the meeting of Gunga, Jumna and Saraswati. I am yet to go to the Triveni ghat at Somnath – the joining of Kapil, Hiran and River Saraswati (again). The three rivers maintain their identity and are visibly different as they merge. While the Yamuna is deep but calm and greenish in colour, the Ganga is shallow, but forceful and clear. The Saraswati remains hidden, but the faithful believe that she makes her presence felt underwater. Much before the Saraswati paper by Yashpal et al (1980), based on NASA-LANDSAT images. Much before Indian Remote Sensing satellites went up in 1979. A leading educationist and currently chancellor of Jawaharlal Nehru University, Yash Pal, who had published in 1980 in his own words “a small paper on the existence of Saraswati river which attracted attention,” concurred with the view. “Surveys so far have brought out clearly the path the river had taken when in flow,” the national research professor told The Pioneer. He did a stint with ISRO (which has played a pivotal role in the probes so far) from 1973-1980 where he set up the Space Application Centre. A case of India’s oral history vindicated by modern research! Some 175-146 years after Hammurabi, the Assyrian throne passed onto his grandson, who ascended the throne of Babylon – and took a very Buddhist name. This is apparently a 1000 years before Gautama Buddha – as per Western dating fix! Known in history as Ammisaduqua /Ammisaduqa (1646-1626) – अमिष, amish in Sanskrit means truth and honesty + duqa = suffering, pain. 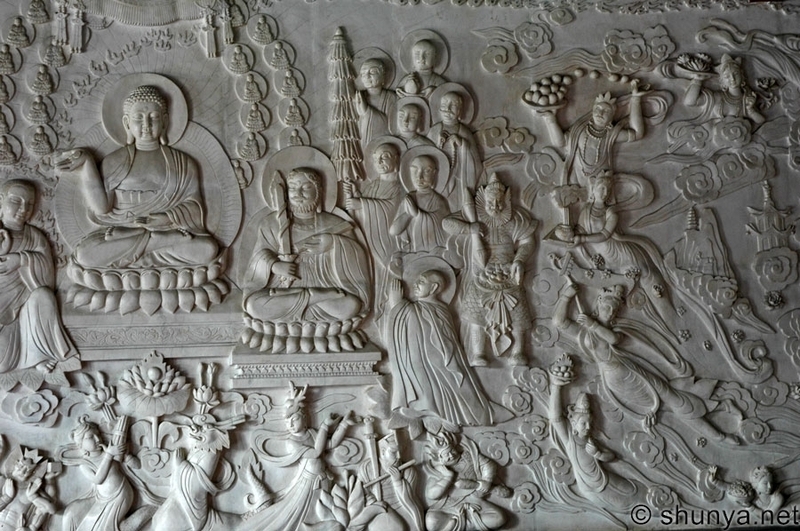 Was Ammisaduqua one of the earliest Bodhisattvas, or one of the earliest followers of Buddha. Western dating gone completely awry? Apart from commissioning an authoritative study on planet Venus (‘probably the earliest example’ of astronomy), Ammisaduqua /Ammisaduqa /Ammizaduga is known for cancelling debts. Was he named Ammisaduqua /Ammisaduqa because he understood the ‘true suffering’ of the people. The discovery of clay tablets at the Kuyunjik mound in mid 19th century, at Sippar, in modern Iraq, (ancient Niniveh), in the palace of Ashurbanipal (668-635 BC), in the 19th century, was the most complete set of tablets recovered, of the study first commissioned by Ammisaduqua. The name of the scribe of these tablets has been variously deciphered as Ku-Aya, Nur-Aya, Ipiq-Aya – and most interestingly, ‘in all probablity, the scribe was called’ Kasap-Aya, the same as the famous Indian rishi Kashyapa, ऋषि कश्यप. Enuma Anu Enlil, the 70 clay tablet series, by astronomer-astrologers in Mesopotamia, recovered from the ruins of Ashurbanipal’s Library, at Niniveh, contains ‘careful records of celestial events for centuries’ – with an inventory of 7000 omens. Enuma-Anu, could also be spelt as Anumaanu. And अनुमान anumana, which in Sanskrit is, estimate, infer, deduce, close (not exact) calculation. Enlil is the Assyrian God of Winds and Skies. Anil अनिल is also the modern Sanskrit word for air, wind. The earliest extant account we get of the Flood, (pralaya प्रलय in Indian texts) Atra-hasis is also ascribed to the Ammisaduqua reign – which can be gauged by the scribal colophon marks. The Atra-hasis is the world’s first account of the Flood (as per Western history) – which is recounted also in the Bible. This account of the Flood, the Atra-hasis, written by Atra, possibly by a scribe named after Rishi Atri, ऋषि अत्रि, one of the writers of the Rig Veda. The scribe writes, “at-ra-am-ha-si”, which in Sanskrit will read as अत्री अम्हसी “Atri am I”. Since (deciphered) Akkadian language, in which these tablets were composed, works on presumptive vowels, (deciphered) vowels are a matter of guesswork, opinion and such. To give the benefit of doubt, most Assyriologists have little or poor knowledge of Indian texts and Sanskrit, which comes in the way of making some of these connections. But wonder turns to puzzlement, when one comes to a Babylonian king called Kandalanu (647-627 BC) – or alternatively, Kundalin(i). Kundali कुण्डली in Sanskrit means circle – of seasons, life, fortune, etc – and janam kundali is made. The measurements of Saturn during Kandalanu’s reign of 20-odd years are important to understanding Mesopotamian astronomy. Saturn in Indian astronomy is Shani शनि. In Indian astrology, Shani casts a dark and baleful shadow on which ever zodiac sign it moves into. It is speculated that the Kandalanu was the throne name for Ashur-bani-pal – at whose library the above clay tablets were found. Historians have have mixed opinions about Kandalanu and Ashurbanipal being the same person. Babylonian astronomy (encompassing Assyrian, Mesopotamian, Sumerian, Akkadian) is closely allied with Indian developments in direction, purpose and history. This challenges modern history, caught between the ‘Greek Miracle’ as history school, which has stuck to the Egypt->Greece->Rome->Europe–>West-Is-The-Greatest Axis. For long, the West has systematically suppressed Indian achievements in various spheres – largely for reasons of colonial propaganda. Western historians trace Indian own significant achievements in astronomy to ‘import’ from Babylon – via Greece! David Brown, an ‘expert’, on Mesopotamian astronomy and astrology, goes further and asserts that the “evidence for transmission to Greece and thence to India in the Hellenistic period was overwhelming.” (from Learned antiquity By Alasdair A. MacDonald, Michael W. Twomey, G. J. Reinink). What is this ‘overwhelming’ evidence that he presents? Nothing, but the usual dating mix ups. Considering “it unlikely that it was the work of one person’ , analysts are surprised, ‘considering its internal consistency”. Worried, Mr.Brown? There is more, where this from, Mr.Brown. Surely, if Indians needed to learn, would it not have been easier and simpler, Mr.Brown, for Indians to have learnt this directly, from the Babylonians – instead of getting of it second hand from the Greeks. WW2 was over. Victors were busy, sharing the spoils. Colonies were awaiting release. Feudal systems were wearing thin at the cuffs. In Upper Egypt, a farmer, Mohammed Ali Samman while digging for ‘sabakh’ (kind of guano, bird droppings used as natural fertiliser), near Nag Hammadi, discovered an earthen jar. Overcoming his initial fears of breaking open the jar (it may well contain djinns), he found some books! Disappointed with his ‘find’, he dumped this in his house along with firewood and straw. His mother used some of the books and pages to start the fire. 20 years later after passing through many hands, it was found that these were the same books that the Catholic Church has been, allegedly, trying to suppress for 1500 years. Only 3 more copies of this book existed in the world. 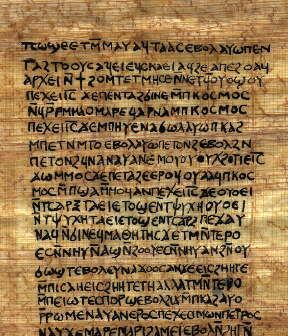 Till the Nag Hammadi finding, there were three surviving copies of the Gnostic book, The Pistis Sophia – the Askew Codex (in the British Museum), The Berlin (or Akhmim) Kodex (acquired in Cairo, Egypt) and the Bruce Codex (bought in Thebes, Upper Egypt, by Lord James Bruce) donated to the Bodlein Library. Two years later, in 1947, at Wadi Qumran, near the Dead Sea, then in Jordan, now in Israel, a Bedouin shepherd boy was finding himself short of his goats. He set out in search of his goats and wandered into nearby caves. In these dark caves, he made a discovery that shook the Christian world. He found earthen jars containing ancient scrolls written in papyrus, animal skin and copper plates also. Over the next 9 years, more than 900 such documents were recovered from 11 nearby caves. The Jordanian authorities handed it over to a team of (mostly) Catholic priests. For 40 years, this team did not release much information. International uproar about the slow progress and the role of the Catholic Church (re. suppression of these documents for more than 40 years) finally forced the teams to open up the documents. Between 1850-1900, Western archaeologists dug up more than 400,000 clay tablets in West Asia. This loot was carried back to the British Museum, Louvre France, Imperial Museum in Berlin, University Of Pennsylvania. Latter day digs and finds were retained in Iraq, Turkey and Egypt. In the last 100 years, of the more than 400,000 clay tablets excavated, less than a 70,000 have been deciphered between the four institutions. Less than one fifth have been published so far. The Elamite capital is called by Western archaeologists as Susa – but correctly is Shushan (was it so called because it was the seat of of शासन ‘shaasan’, the Sanskritic word for governance). It was initially populated by an aboriginal tribe called ‘uwaja’ (did the Elamites call them पूरवज ‘purvaja’ – Sanskritic for ancestors) and some other Greek sources called them Uxii. Alfredo Trombetti, an Italian Elamologist, was an Italian linguist who theorised that all the languages in the world evolved from one language – monogenesis of language, his theory is called. In his book, Elementi Di Glottologia, he worked backwards to North India as the source of all languages. Trombetti learned French, German, Greek, Hebrew and Latin by himself. He spoke these languages when he was 14 years old. In the colonial era, where Britain was the single super cpower, such credit given to India was not welcome. Archibald Henry Sayce’s essays dealing with Elamite: ‘Amardian or Protomedic Tablets in the British Museum’ settled the initial direction for interpretation for Elamite studies. Hittites were one of the main branches of Indics in the region. Ramesis II is about 100 years after Akhenaten – (एकनाथन Eknathan meaning One God in Sanskrit). Akhenaten’s father is AmenhotepIII who wanted to marry the Mittani (another Indic kingdom) princess of Dashratta (Tushrutta). The Indic influence and presence is overwhelming in the Levant at this time. E.g. Instead of building mausoleums, Akhenaten built temples – much like other Indian kings (seen after 10th century AD). After this there is a slow fadeout and decrease of the Indic rule in the Middle East. The Achmenaid Persians take-over from Elamites (The Indic Dravidians who settled Persia). Egypt became a Roman colony – and turned westward. Judaism began to grow. West Asian reluctance to give up slavery, made Indo Aryan rulers disengage politically from West Asia and Middle East. Judaism, Christianity and Islam, the three ‘desert religions’, gained their first converts from slaves, but continued with slavery till the 20th century. The 3 ‘desert religions’ instead of reforming slave societies, just enabled the transfer of slave titles. Freedom meant old slaves became the new slave masters. Non-political Indian role in West Asia and Middle East continued to grow in terms of trade and learning. Babylon became a part of Alexander’s empire (and then the Roman Empire). The slave revolt of Egypt by Moses, made the Indic rulers reform and distance themselves from the slave owning societies. Hence the fade out of the Indic rule from the Middle East – but the continuation of Buddhist influences, trade and peoples contact. This slave reform and distancing of Indic rulers from slave societies was led by Indian reformers like Buddha and Mahavira. This happened not around and after 500 BC as determined by Western dating logic (which needed to fit the Aryan Invasion Theory, The ‘evolution’ of Greek and Romans) – but around 1000 BC. In the extended India, slavery was an inherited social system – for which the Hittites made some liberal laws. The inherited norm of slavery was sought to be liberalised, in incremental manner by the Indic societies of the Middle East. This incremental liberalisation created a backlash against the ‘holier-than-thou’ Indians, by the slave-owning, ruling classes of the non-Indic societies – and the newly liberated classes also. The ancient equivalent of Nixon’s outbursts against the ‘sanctimonious Indians.’ It was this humane treatment of slaves and humanization of criminals which has possibly resulted in a the low crime rates in India. Possibly, the Indic reformers. The liberated blame the liberator. Much like Gandhiji was killed by a Hindu. Anti-Babylon tirades in in the Judeo-Christian tradition were a direct result of this anti-slavery attitude of the Indics in the Middle East. Moses and Semitic followers freed themselves – and enslaved others. Possibly, the Indics in Babylon did not approve of such practices – and hence the anti-Babylon tirades. This liberalisation triggered a (vengeful) Moses to walk out of Egypt and formed Judaism – a monotheistic religion. The (suspected) Pharaoh at that time was Ramesis-II roughly between 1300-1200 BC. This is also when the Battle of Kadesh happened with the Hittites, which resulted in the most famous treaty. The cause of this battle was the defection of King Benteshina of the Amurru (is the correct name Bente = वंश vansha in Sanskrit and shin = moon goddess; meaning Chandravanshi?). The Amurru, (also known as Amorites) possibly switched sides from being an Egyptian vassal, to a Hittite ally. Were Amurrus, the Mauryas who later defeated the Seleucid army? As the political disengagement progressed, the Indic rulers also changed the military paradigm. Buddhist texts talk about 16 mahajanapadas – which formed this ruling federation. The foremost administrative innovation was the concept of Bharata(ah) – the aryavart and the arya dhwaj. Comprising of 16 to 30 mahajanapadas, Bharata(ah) became a federation of kingdoms. Each of these kingdoms became a series of succeeding lines of defence against invading armies. What the European Union is grappling with, (and may yet fail) for the last 300 years, was implemented and used 3000 years ago in India. Six other important changes were seen. One – war chariots became less important. By the time of Alexander’s march in India, chariots were a minor part of the Indian armies. Instead, the importance of cavalry increased. Bessos, the Bactrian mathista, designated to succeed Darius III, led the successful Indic cavalry charge, at Gaugamela, on the Macedonian right flank – which forced Alexander to focus on the centre of the Persian army, led by Darius III. When Alexander finally was able to make his way to India, he met a fierce onslaught of the Indian cavalry units – supported by fearsome elephants. Indian cavalry units were always smaller than in other nations due to paucity of horses in India. India was a traditional importer of horses. For combat use, Indian cavalry used imported horses and Indian breeds (like the marwari breed) were smaller – easily trained and more intelligent, but smaller and less stamina, were used as as pack animals . Two – a system of alliances supporting frontline kingdoms in the entire North West Indian swath was formulated. For instance, against the Assyrian invasion, led by Semiramis, a minor Indian king, Stabrobates, was supported to beat back the Assyrian invasion. Against Cyrus the Great, Tomyris, a Scythian Queen was supported to massacre the Persian invaders. Alexander’s nightmare began immediately, as soon as he crossed into the Indic area. Instead of the complete collaboration that Alexander got from the defeated Achmaenid ruling family of Sisygambis, Stateira, Oxathres (brother of Darius III; also written as oxoathres and oxyathres) et al, the foursome of Bessos, Spitamenes, Datafernes and the Scythians made Alexander’s life miserable. At Gaugamela, it was Bessos and his cavalry which broke Alexander’s formation. The tribes and kshatrapas (satraps) of Indian North West swath, delayed Alexander for nearly three years – before he could step into India. In India, Alexander had to pay the King of Taxiles, Omphis, (Ambi) 1000 talents of gold (more than 25 tons of gold) – to secure an alliance. He had to return the kingdom of Punjab to Porus – purportedly, after winning the battle. His loot and pickings from India were negligible. Thus while, invaders were kept at bay, within the Indic area, borders and crowns kept changing and shifting. Three – the biggest game changer were the elephant corps. War elephants was an Indian invention and an Indian monopoly. After the defeat and death of Cyrus The Great at the hands of Tomyris, the Persians stopped looking India-wards. 500 years later (nearly), with the help of the Indian elephant corps, the Sassanians stopped the Romans at Persian borders. With these three changes, Indian heartland became invincible. Empire builders like the Assyrian Queen, Semiramis and the Achmaenian Emperor, Cyrus the Great mounted expensive campaigns to conquer India – and barely escaped with their lives. Later, Genghis Khan’s armies avoided India completely. Timurlane could invade India – when Delhi was under rule by a foreign dynasty, the Tughlaks. Indian invincibility and military prowess was unmatched for till the 13th century – when the first foreign rulers, the Slave Dynasty rulers from the Levant started ruling from Delhi – Qutubuddin Aibak, in 1206. Four – Indian teachers and intellectuals were sent to all corners of the world. The spread of Buddhism in Asia is well chronicled. Socrates’ encounter with an Indian yogi however, is not so well known. Mani, the Buddhist teacher was feared by the Vatican for the next 1000 years. Vatican killed, burnt and quartered all those who displayed any leaning towards Manicheanism. Islamic invaders searched and destroyed statues or ‘boet’ (meaning statues of Buddha?). Five – the legal and political structures were popularized. The usage of gold was popularized and became widespread as an economic tool. Coinage in India was not a royal prerogative or implemented by fiat. Thus, for instance, there were intricate Greco-Bactrian coins, (probably privately minted) compared to crude and simple Indic official coins. Sanskritic and Darvidian systems were used to structure ancient languages like Akkadian and Elamite. Slavery in Asia went into remission till the rise of Islam. Religious persecution became a random occurrence. Asian economy accounted for between 50%-80% of world economic output. Alexander’s takeover of the Assyrio-Persian empire in Asia was largely reversed. The spread of the Roman Empire, built on slavery and loot, was halted at West Asia. The Sassanian Dynasty with its elephant corps, the Zend-hapet, or “Commander of the Indians,” blockaded the Asian continent from Western invaders – which stabilized Asiatic societies. Initially, the Sassanian dynasty was able to wrest back and later defend the Persian dominions from the Greco-Romans rulers after setting up an Indian elephants corps in their army – evidenced, for instance, by the carvings at Taq-i-Bustan. At one time, the Sassanian rulers had increased its elephant corps to 12,000 elephants. Sixth – Technologically, the Indian invention of Wootz steel, was another game changer. Wootz steel, which was an Indian monopoly from 500 BC till nearly 1900 AD, was the best steel for swords, lances, spears – for defence products. Wootz steel, was the preferred input in the world, for swords, pistols and such. Known as Damascus steel, it went into Japanese Katanas, European guns. The famed Damascus steel swords, armour and pistols, used steel ingots imported from India as Wootz steel. Indian exports of Wootz was a big earner for India till British efforts killed this industry in India. Subsequent efforts to “reverse engineer” this technology in Europe during the 20th century, has been unsuccessful. Damascus was the trading centre over which the Battle of Kadesh, the biggest chariot battle, was fought between the Indo-Aryan Hittites and the Egyptian Pharoah Ramesses-II fought. Christ – a more forgiving man than the vengeful Moses, came in a little later. His life as a young man has been obscured. Till 400 AD, Buddhism was blanking out Christianity. Constantine’s Council of Nice, the subsequent State patronage and force of Church oppression thereafter ensured the survival and growth of Christianity. Mani, a Buddhist preacher who also talked of Christ as a major reform teacher was seen as a major threat by the Church from 250 AD to till about 1500 AD. Buddhism had already spread to Sri Lanka, India and Afghanistan – making waves. The Church was having a uphill time in gaining believers from new religions – like Buddhism, and Mani, a Persian Buddhist teacher trained in India. The Manichean religion was an eclectic mix of Buddhism, Zoroastrianism, Hinduism, Mithraism. It appealed to significant sections of the population, as it showed continuity from earlier faiths. It recognised earlier prophets and teachers like Buddha and Jesus – and Mani as the last teacher in this line of prophets. Christian writers (Hippolytus and Epiphanius) write about Scythianus, who visited India around 50AD from where he brought ideas about Apokatastasis (re-birth) – “the doctrine of the Two Principles”. Scythianus’ pupil Terebinthus (Tere – Lord + binthu = Hindu; Hindu Lord) called himself as a “Buddha” (“Buddas”), as mentioned in writings of Cyril of Jerusalem). Terebinthus went to Palestine and Judaea where he met the Apostles “becoming known and condemned”, and ultimately settled in Babylon, where he transmitted his teachings to Mani. This religion spread far – from Europe to China. In China, this was integrated with Buddhist beliefs (Taisho Tripitaka). In Afghanistan, Iran it was Aiyn-e-Mani. In Europe it became Manichean. This posed a challenge to the Church. The response of the Church – wipe the very thought of a different belief. Simply put, this religion posited that there is an eternal struggle between Good and Evil. Men should protect themselves against evil (the Roman Church feared that this may lead to Devil worship) and lead a life of virtue. The Vatican Church believed that there was God and he did not create evil. Women (Eve) did. This was the Original Sin. All mankind are sinners now and need to pray to God (and Jesus was his son and sent to Earth to save mankind) and redeem ourselves. St.Augustine was canonised for his conversion from Manichean to Christianity. Pistis Sophia (surviving as Bruce Codex, Berlin-Akhmim Codex and Askew Codex) were suppressed by Britain and Germany for decades. Rediscovered as Dead Sea Scrolls and Nag Hamamdi manuscripts, research has been slowed to a crawl. The question now is no more ‘did Buddhism influence Christianity’ but ‘how much did Buddhism influence Christianity’. Do these manuscripts show a greater extent of Buddhism than colonial Britain, supremist Germany and the Vatican would like to admit? Slavery in India, disappeared from about 1000 BC. Zilch. Nyet. Non. Nada, nada. Unlike in the rest of the world, no records, ever, have been found of human trafficking in the Indic bloc. Indian pauranik and classical history begins to make sense only after the concept of ‘asuras’ as a verbal cue for slavery, slave masters and slave traders is used. Sanskrit and Indic languages have no word for ‘slave’. In modern times, India’s rise as a power in computing industry, is also partly due to the same logical structure of Sanskrit language. While the Levant and the Occident continued with slavery for the next 3000 years, till 1900 AD, in India (referring to the Greater India, including the Hittites and Mitannis) after 1100 BC, slavery vanished. Compared to the retributive and vengeful Hammurabi’s code, the Indic rulers of Middle East (the Hittites, Mittanis and Elamites) already had a more liberal and humane legal system. Buddha and Mahavira come in. Western historian dates are slotted for 500 BC for the ahimsa ‘twins’. What if the Buddha and Mahavira are from the 1000 BC – and led the reform against slavery. This also ties in with the historic (and unique) movement of Indian diet towards an increase in vegetarian component. Indic rejection of slavery, led to their disengagement from the Middle East, where other cultures, continued with slavery. From dominance, Indians became satisfied with presence and influence. Capture by slave traders and slavery was also the reason, that possibly, Indian traders preferred buyers to come to them. This also accounts for the system of unarmed combat that travelled with Buddhist monks to China – and became Chinese Kung Fu, or the Kalaripayattu (in Kerala) or the system of लठैद (combat practitioners using ‘lathis’ – bamboo sticks). The exhortation towards ‘ahimsa’ is an appeal to the ‘oppressors’ to stop ‘himsa’ against all life – and similarly for the oppressed to resolve the social issues by ‘ahimsa.’ There is of course, some merit in taking some issues like oppression at a general level, as a matter of principal – and not to get bogged down in specifics. Do keep in mind that Elamites, (cousins of modern Dravidians) founded Persia; the Middle East was influenced and had significant presence of Indic Mittanis and Hittites – and India was far bigger than what we see today. Slave memory faded out and there are only some stray references in Indian classical literature about slavery – like the Harishchandra story. The understanding of the word ‘asura’ changed – and foreign words like ‘ghulam’ made their way into Indic languages. Jataka stories (mainly considered as children’s stories in the West) are a reflection of social mores, realities- and also cautionary tales for adults. This Jataka story (click on the link) refers to a “demon’ (another word for a slave trader) and cautions travellers and merchants about slave traders. This ‘demon’ kidnaps the merchant – but leaves the goods behind. Similarly, the story of Bali, the righteous Asura king, who was sent to the patalaloka, by Vamana, makes sense, the moment ‘demons’ are defined as slave-owners and enslavers. Historically, trade in India is governed by शुभ लाभ ‘shubh labh’ – and hence Indians have not been major players in drugs proliferation (unlike Japan, the West in which traded Opium in Korea and China) or in slave trade. In modern times, though India is a power in computing industry, India is not a big player in spamming or in software virus. In August 2008, there was hoax story, which alleged that an Indian hacker, had broken into a credit card database – and sold to the European underworld – and some ‘experts’ feared that this would spark of a crime wave across Europe. Around the 1000 BC inflection point, there is another interesting thing that happened – the so called Greek Dark Age. From 1200 BC to 900 BC – when the Indic kingdoms, like Hittites, the Mittanis and Elamites were dis-engaging from the Levant, the Greeks went through ‘a catastrophe’. Egypt and Mesopotamia were threatened. Two Mycenaen cities, 40 other cities of Turkey, Syria and Middle East were destroyed. The Greek Miracle assisted by the revival of trade links with India through the Phoenicians in 900 BC. And the Greek city states who were the recipients of the slaves from the Anatolia. These new found slaves from the Middle East spurred the ‘Greek Miracle’. And who were the Phoenicians? Some suggest that the word ‘phoenia’ is corruption of ‘bania’ – and these were the South Indian sea-traders, with ships made in Masulipatnam and Sopara. So what was behind the the Indian disengagement from West Asia, the Greek Dark Age and the fall of the XVIIIth dynasty of Egypt. Moses and Judaism, slavery, revolt of the slaves is my hypotheses. With the walkout by slaves, cities became dirty, plague broke out, agriculture suffered and locusts descended. With malnutrition, hunger and deprivation, came diseases.The newly liberated slaves fled to Greece – on Phoenician ships, where they were enslaved again. And who went to town claiming credit for mishaps in Egypt? Moses, proclaiming the power of his God. This outbreak of war between the slave owners, led to reform in Indian diet. Increased vegetarianism in India. India diets (there are vast regional and ethnic variations) has the lowest ‘meat’ content in the world. The sheer dominance of non-meat items in the normal Indian diet is unique in the world. This also made the cow ‘holy’ – as the cow saved Indians during this difficult times. The Indian cow is incredibly easy to maintain. The Indian zebu cow yields nutritious milk, butter, ghee, eats anything, is resistant to diseases, has a long life (15-20 years), short gestation period, bull calves can be used as ‘draft’ animals, cow-dung can be used for fuel – and, of course, cow skin makes the best leather. At least 3000 years ago, India went ahead and created a new economic model without slavery. The Occident and the Levant were using slaves till 20th century. Middle East’s labour laws even today smack of slave owner mentality. It was these events in 1000 BC which made two things happen. It catalysed the refinement and consolidation of Sanskrit, the Vedas, The Ramayana, The Mahabharata et al. And it led to many reform leaders, the Bodhisatvas and Tirthankaras – prime amongst whom were Buddha and Mahavira, who counselled patience, introspection, ahimsa to their followers. In modern times, the easiest test of oppression is ‘statistically significant’ population decline. And there has been no population decline in India to even talk about ‘oppression’ in the genocidal meaning that the West tries equating with India – to cover up their own genocides. Of course, Western historians (and its followers) will throw the problem of dates at this hypothesis. Buddha and Mahavira were periodized circa 500 BC by Western historians; to ensure that the Greeks got all the credit and that the Aryan invasion theory became feasible. A relook at the dates will support this hypotheses. The other aspect is that even if Buddha and Mahavira are correctly dated, the role of Tirthankaras and Bodhisatvas (highly regarded by Gautama Buddha and Mahavira) cannot be diminished in the reform story. The gentleman who is supposed to have ‘fixed’ Gautama Buddha’s birthplace, date and time was a certain Dr.Alois Anton Fuhrer. This gentleman was subsequently accused of having tampered with archaeological artifacts – and the Lumbini artifacts etc. Call it reform or evolution. Slavery was clearly an inherited institution in some part of the great Indic spread.